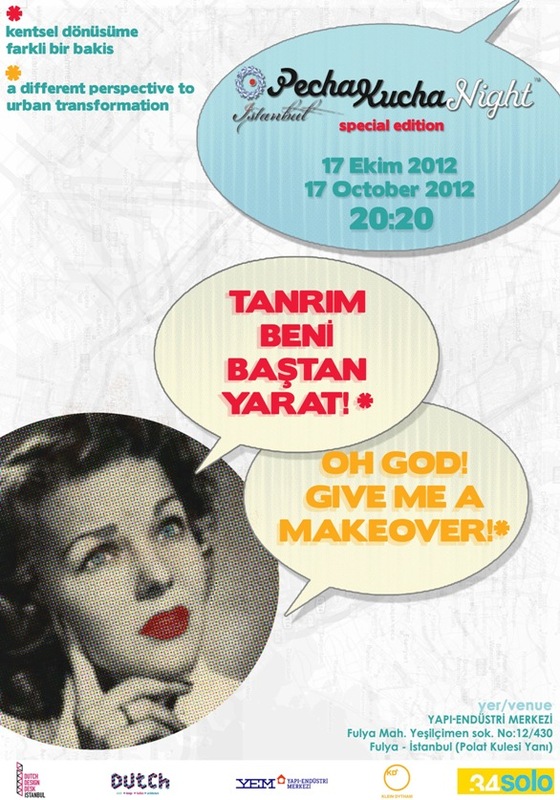 PechaKucha Night İstanbul Vol. 15 Special Edition will take place at The Building Information Centre (YEM) on October 17th. This PechaKucha Night ispart of the Dutch Creative Industry Mission to Istanbul, 14-18 October 2012, and is organized by DutchDFA, in cooperation with the Consulate-General of The Netherlands and the Dutch Design Desk Istanbul. ‘Oh God! Please Give Me A Makeover!’ As all the efforts on urban transformation /regeneration / revitalisation go on, what are we transforming into as citizens? How new urbanism regenerate the way we are and the way we behave? Are we really getting revitalized? What is the new URBANITAS? Around the theme of ‘Urban Transformation’, architects, designers and fashion designers from Turkey and the Netherlands will present their cases. Join the discussion as a presenter or audience at 20:20. For details and registration please contact.